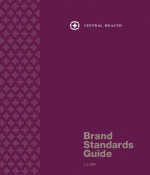 All of the information below, as well as additional guidelines, are found in the Central Health Brand Standards Guide. The Central Health logo includes both the organization symbol and the logotype of the name. The brand mark refers collectively to the various configurations of the logo, including the white space surrounding these elements. To maintain consistency across varied applications, only 2 configurations of the brand mark should be used. The vertical configuration, with the “Central Health” logotype centered and stacked below the symbol, is preferred for primary use. In situations where a horizontal configuration is required for scale or impact, please use the horizontally oriented logo. The positions, proportions, size and color of the elements of the Central Health brand mark are part of the execution of the brand and should not be altered. Please do not attempt to replicate the Central Health brand mark without access to the original elements. 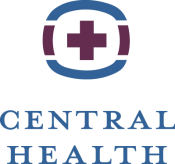 The white space that contains the elements of the Central Health logo should be seen as an integral component of the brand mark. As well, a minimum clear space should be maintained around the mark to ensure the prominence and clarity of the logo. 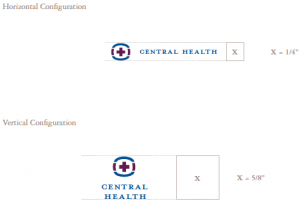 As shown, clear space refers to the distance of “X” — the height of the plus sign — surrounding each side of the Central Health logo, at whatever size it is used and in all configurations. 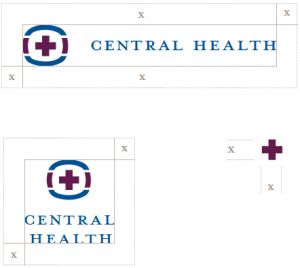 The smallest size at which the Central Health logo may be reproduced to ensure legibility is 1/4 inch in height in the horizontal configuration, which is preferred for small spaces, or 5/8 inches in height in the primary (vertical) configuration. Central Health’s primary colors are deep purple and dark blue. PMS 653; CMYK 100, 60, 0, 18; and RGB 32, 85, 138.